Near the Ponte dell'Accademia, this double palace, one of the landmarks near the mouth of the Grand Canal, once belonged to one of Venice's pre-eminent patrician families. The Barbaro clan made its fortune in the salt trade, and famously (or infamously) boasted of its military prowess on the facade of Santa Maria Zobenigo. 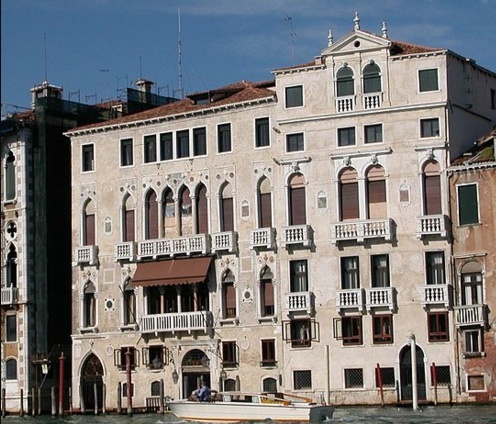 The Venetian Gothic side was designed in 1425 by Giovanni Bon, and is one of the best surviving palaces in the style; the Baroque side was added in 1694 by Antonio Gaspari. It had a grand ballroom decorated by Sebastiano Ricci and Piazzetta, and a magnificent library with a ceiling on the Glory of the Barbaro Family by Giambattista Tiepolo. But after Venice fell to Napoleon it all went sour for the family, and by 1851, when Ruskin visited Venice, only two elderly Barbaro brothers survived, eking out a meagre existence in the garret. After their deaths, it was sold to speculators who stripped of its art (Tiepolo's fresco now adorns the Metropolitan Museum in New York). In the later 19th century, the Palazzi Barbaro was purchased by Daniel Sargent Curtis, a Boston banker and relative of painter John Singer Sargent, who visited often and painted a beautiful series of watercolours in the city. So many other artists and writers stayed and visited—Henry James, Bernard Berenson, James Whistler, Claude Monet, Robert Browning, Edith Wharton, and art patron Isabella Steward Gardner—that there was talk of a 'Barbaro Circle'. The Curtis family still owns the Baroque palace. Henry James described the lavish Baroque ballroom in his novel, The Wings of the Dove, and it was used in the 1997 film adaptation of the same; it also appeared in Vampire in Venice as the home of Professor Catalano (Christopher Plummer), the vampire hunter. You can read all about it in John Berendt's The City of Falling Angels.